عباسی, امین, تاتار, محمد, عباسی, محمدرضا, یمینی‌فرد, فرزام. (1391). لرزه‌شناسی دستگاهی بخش خاوری گسل مشا. 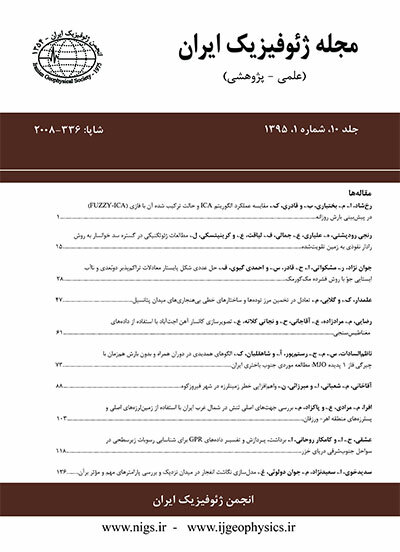 مجله ژئوفیزیک ایران, 6(1), 127-146. امین عباسی; محمد تاتار; محمدرضا عباسی; فرزام یمینی‌فرد. "لرزه‌شناسی دستگاهی بخش خاوری گسل مشا". مجله ژئوفیزیک ایران, 6, 1, 1391, 127-146. عباسی, امین, تاتار, محمد, عباسی, محمدرضا, یمینی‌فرد, فرزام. (1391). 'لرزه‌شناسی دستگاهی بخش خاوری گسل مشا', مجله ژئوفیزیک ایران, 6(1), pp. 127-146. عباسی, امین, تاتار, محمد, عباسی, محمدرضا, یمینی‌فرد, فرزام. لرزه‌شناسی دستگاهی بخش خاوری گسل مشا. مجله ژئوفیزیک ایران, 1391; 6(1): 127-146. گسل مشا یکی از گسل‌‌های مهم و تهدیدکننده کلان‌شهر تهران (پایتخت کشور) است. تا پیش‌از این تحقیق، دانش زلزله‌شناسی دستگاهی منطقه به داده‌های کم، همراه با خطای تعیین‌مکان به‌ویژه در عمق و تعداد اندک سازوکار کانونی در پیوند با روند مشا، محدود بوده ‌است. در تحقیق حاضر، خُرد‌لرزه‌‌‌‌های(Micro Earthquakes) خاور لبه‌جنوبی البرز مرکزی به‌ویژه بخش خاوری گسل مشا به کمک نصب شبکه موقت محلی و متراکم، ثبت و پردازش شده‌ است. پس از خوانش فاز امواج پوسته‌ای(Pg, Sg)، زمین‌لرزه‌های دارای پوشش آزیموتی مناسب و خطای باقی‌مانده زمانی(Timing Residual errors) و مکانی ناچیز پالایش شد و برای تعیین نسبت سرعت امواج(Vp/Vs) و محاسبه مدل یک‌بُعدی ساختارسرعتی پوسته بالایی به کار رفت. سپس با مکان‌یابی دقیق و حل سازوکار ژرفی خُرد‌لرزه‌‌‌‌های قابل‌اعتماد، لرزه‌خیزی، چگونگی جنبش، هندسه گسله‌ها و وضعیت لرزه‌زمین‌ساختی منطقه بررسی و تحلیل شد. Mosha is one of the most important and threatening faults in TehranMegacity (Capital of Iran). Instrumental seismology in the region was limited to insufficient data along with location errors especially in depths as well as the small number of available focal mechanisms in bound with the trends in Hedayati et al. (1976) and Ashtari et al. (2005). In the study ahead, by installing 48 local and temporary seismological stations during June to November 2006, micro earthquakes around the eastern part of the southern flank of central Alborz particularly the Mosha fault zone were recorded and processed. The local temporary network consisted of 24 one-vertical-component TAD-2 Hz, 11 3-components MiniTitan- 5 S and 13 3-components Guralp 6TD 0.02-10 S sensors. Sampling rates were 100 samples/sec the for Guralp sensors and 125 samples/sec for the others in continuous and triggering threshold modes. 115 well recorded micro earthquakes with an appropriate azimuthal gap (Gap ≤ 180°), a trivial residual timing and location errors (RMS ≤ 0.3 sec, Erh ≤ 2 km and Erz ≤ 3 km) were selected and applied for the wave velocity ratio (Vp/Vs) calculation based on Wadati (1933) and Chatelain (1978) approaches (1549 P-wave and 1495 S-wave arrival times). A 1-D model of the upper crustal velocity structure was determined as well. SEISAN software (Havskov and Ottemöller, 2005) for phase readings, Hypo71 (Lee and Lahr, 1975) Hypocenter (Barry, 1994.) for seismic event locations, VELEST (Kissling, 1988) for a crustal velocity layers model and FOCMEC program (Snoke, 2003) for focal mechanism solutions were used. Four layers at the depths 3, 7, 16 and 24 km of the crust were determined with P-wave velocities of 5.4, 5.8, 6.1 and 6.25 km/sec, respectively. Accurate locations of 553 micro earthquakes and 15 A and 31 B (excellent for A and good for B groups in red and blue colors in related figures respectively) classes of focal mechanism solutions of the reliable micro earthquakes with a high quality of P-wave first arrival polarities (more than 8 Pg onset’s signs), were provided for the possible analyses of seismicity, the fault geometries-movements and seismotectonic interpretations. We have found that the Eastern part of Mosha fault, longitudinally located from 51.7° to 52.5°, has a northward high dip angle and complex focal mechanisms. The fault mechanisms varied from thrust, strike slip with a small reverse component to reverse with a small normal component from the West to the East. From grouping analysis of the focal mechanism P (or T) axes, the strikes, N 40 (or N 130) were derived for the compression (or tension) stress direction approximately. The focal mechanisms accompanying with the geodynamic analyses from GPS measurements in the studied area reveal a slip partitioning in the local and regional scale compatible with some conclusions from the previous studies (Ritz et al., 2006 and Tatar et al., 2007). Although micro and large earthquakes nonlinearity relation in stress axes orients as true or not proved is important (Mercier et al., 1991 and Hatzfeld et al., 1999), seismotectonics strain analyses of the micro earthquakes in the studied area show the same results of the large earthquakes stress analyses in stress inversion method by Gillard and Wyss (1995). In addition, this study has demonstrated a seismic active trend as mentioned by Jajrood-Pardis-Absard in the South of Mosha fault. Concentrated seismic activities around Mosha fault in the time of data recording have shown that it is a potential hazard for the studied area. عباسی، ا.، 1388، لرزه‌خیزی و لرزه‌زمین‌ساخت لبه‌جنوبی البرز مرکزی، پژوهشگاه بین‌المللی زلزله‌شناسی و مهندسی زلزله، پایان‌نامه دکتری. عباسی، م. ر.، 1381، وضعیت جهت تنش نوزمین‌ساختی در لبه‌جنوبی البرز مرکزی، پژوهشگاه بین‌المللی زلزله‌شناسی و مهندسی زلزله، گزارش پروژه. عباسی، م. ر.، سلیمانی، ش. و مبین، پ.، 1387، بررسی‌های مورفوتکتونیکی روی افراز گسل مشا در دره مشا، پژوهشگاه بین‌المللی زلزله‌شناسی و مهندسی زلزله، گزارش پروژه. یمینی‌فرد، ف.، سیاهکالی مرادی، ع.، حسینی، م. و نوروزی، ر.، 1388، مطالعه لرزه‌خیزی تهران بزرگ و مجاورت آن با استفاده از داده‌های ثبت‌شده در شبکه لرزه‌نگاری شهر تهران، فصلنامه علوم زمین، شماره 73، 133 - 138. Abbassi A., Nasrabadi A., Tatar M., Yaminifard, F., Abbassi, M. R., Hatzfeld, D., and Priestley K., 2010, Crustal Velocity Structure in the southern edge of the Central Alborz (Iran), Journal of Geodynamics, 49, 68-78. Ambraseys, N. N., Melville, C. P., 1982, A history of Persian earthquakes, Cambridge Earth Science Series, Cambridge University Press, London, 212 pp. Allen, M., B., Ghasemi, M. R., Shahrabi, M. and Qorashi, M., 2003, Accommodation of Late Cenozoic Oblique Shortening in the Alborz range, northern Iran, Journal of Structural Geology, 25, 659- 672. Ashtari, M., Hatzfeld, D., Kamalian, N., 2005, Micro Seismicity in the Region of Tehran, Tectonophysics, 395, 193-208. Axen, J.G., Lam, S. P., Grove, M., Stockli F. D., and Hassanzadeh, J., 2001, Exhumation of west-Central Alborz Mountains, Iran, Caspian Subsidence, and Collision-related tectonics, Geology, 29(6), 559-562. Ballato, P., Nowaczyk, N., Landgraf, A., Strecker, M.R., Friedrich, A. and Tabatabaei, S.H., 2008, Tectonic control on sedimentary facies pattern and sediment accumulation rates in the Miocene foreland basin of the southern Alborz Mountains, northern Iran, Tectonics, 27, TC6001. Barry, R. L., 1994, HYPOCENTER 3.2: A Computer Program for Locating Earthquakes, Locally, Regionally and Globally, Hawaii Institute of Geophysics and Planetology, 2525 Korea Rd Honolulu HI, 74pp. Berberian, M., 1983, The southern Caspian: a compressional depression floored by a trapped, modified oceanic crust. Canadian Journal of Earth Science, 20, 163-183. Chatelain, J. L., 1978, Etude fine de la sismicité en zone de collision continentale à l’aide d’un réseau de statios portables: la region Hindu-Kush-Pamir. Thèse de 3 éme cycles, University of Paul Sabatier, Toulouse. Ehteshami Moinabadi, M., and Yassaghi A., 2006, Geometry and kinematics of the Mosha Fault, south central Alborz Range, Iran: An example of basement involved thrusting, Journal of Asian Earth Sciences, 29, (5-6), 928-938. Engdahl, E. R., Jackson, J., Myers, S. C., Bergman, E., and Priestley, K., 2006, Relocation and assessment of seismicity in the Iran Region, Geophysics Journal International, 167, 761-778. Engdahl, E. R., Van der Hilst, R. and Buland, R., 1998. Global teleseismic earthquake relocation with improved travel times and procedures for depth determination, Bulletin of Seismological Society of America, 88, 722-743. Frechet, J., and Thouvenot, F., 2000, PICKEV 2000 Software, Copyright 1993-2006, JosephFourierUniversity (UJF) and NationalCenter for Scientific Research (NCSR), SISMALP Network. Jackson, J., Priestley, K., Allen, M., and Berberian, M., 2002, Active tectonics of the SouthCaspianBasin, Geophysics Journal International, 148, 214-245. Gillard, D., and Wyss, M., 1995, Comparison of strain and stress tensor orientation: Application of Iran and southern California, Journal of Geophysical Research, 100(B11), 197-213. Harvard 2009, Department of Geological Sciences, Centroid Moment Tensor catalogue, available on line at: http://www. seismology.harvard.edu/CMTsearch.html. Hatzfeld, D., Zizzia, M., Kementzetziduou, D., Hatzidimitriou, P., Panagiotopoulos, D., Makropoulos, K., Papadimitriou, P., and Deschamps A., 1999, Microseismicity and focal mechanisms at western termination of the North Anatolian fault and their implications for continental tectonics, Geophysics Journal International, 137, 891-908. Havskov, J., and Ottemöller, L., 2005, SEISAN: The earthquake analysis software for windows, Solaris, Linux and Macosx, Version 8.1. Hedayati, A., Brander, J. L., and Berberian, M., 1976. Microearthquake survey of Tehran region, Iran, Bulletin of the Seismological Society of America, 66, 1713-1725. Kissling, E., 1988. Geotomography with local earthquake data, Review of Geophysics, 26, 659- 698. Landgraf, A., Ballato P., Strecker, M. R., Friedrich, A., Tabatabaei, S. H., and Shahpasandzadeh, M., 2009, Fault-kinematic and geomorphic observations along the North Tehran Thrust and Mosha Fasham Fault, Alborz mountains Iran: implications for fault-system evolution and interaction in a changing tectonic regime, Geophys.l J.l Int., 177, 676-690. Lee, W. H. K., and Lahr, J. C., 1975, HYPO71 (Revised): A computer program for determining hypocenter, magnitude, and first motion pattern of local earthquakes, United States Geological Survey Open File Report, 75-311, 113 pp. Maggi, A., Priestley, K. and Jackson, J.A., 2002, Focal Depths of Moderate and Large Size Earthquakes in Iran, Journal of Seismology and Earthquake Engineering, 4, 1-10. Ritz, J. F., Nazari, H., Ghassemi, A., Salamati, R., Shafei, A., Solaymani, S., and Vernant, P., 2006, Active transtension inside central Alborz: A new insight into northern Iran- southern Caspian geodynamics, Geology, 34, 477-480. Tatar, M., Jackson, J., Hatzfeld, D., and Bergman, E., 2007, The 2004 May 28 Baladeh earthquake (Mw 6.2) in the Alborz, Iran: Over thrusting the South Caspian Basin margin, partitioning of oblique convergence and the seismic hazard of Tehran, Geophys. J. Int., 170, 249-261. Trifonov, V.G., Hessami, K.T., and Jamali, F., 1996, West-Trending Oblique Sinistral-Reverse Fault system in Northern Iran, IIEES Special Publication, 75, Tehran, Iran. Vernant, P., Nilforoushan, F., Chery, J., Bayer, R. Djmour, Y., Masson, F., Nankali, H., Ritz, J-G., Sedighi, M., and Tavakoli, F., 2004, Deciphering Oblique Shortening of Central Alborz in Iran Using geodetic data, Earth and planetary Science Letters, 223, 177-185. Wadati, K., 1933, On the travel time of earthquake waves, Part II, Geophysical Magazine, 7, 101-111. Waldhauser, F., 2001, hypoDD--A Program to Compute Double-Difference Hypocenter Locations (hypoDD version 1.0 - 03/2001), U.S. Geol. Survey 345 Middlefield Rd, MS977 Menlo Park, CA 94025 Open File Report 01-113, 25pp. Waldhauser, F. and W. L. Ellsworth, 2000, a double-difference earthquake location algorithm: Method and application to the northern Hayward fault, Bull. Seism. Soc. Am., 90, 1353-1368.